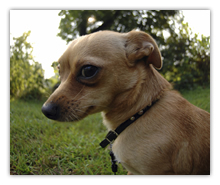 An eight year old Chihuahua who was very aggressive towards his owners. He barked frantically at visitors, snapped at visiting grandchildren was very wary of babies. His excessive barking had caused his owners to think along the lines of having to put this dog to sleep as they had reached the end of their tether and had tried everything they could think of to improve his behaviour. They could not even take him out on a lead and were having to walk him very early in the morning or very late at night when no-one else was about. He would bark at a plastic bag lying in the road! He wouldn’t even let them sit next to each other on their couch. But this amazing little character and his caring owners turned Dizzy’s negative behaviour totally around in three weeks. Two months on and he now walk’s quietly on a lead, he loves it when children come to play and is respectful of their space. All his aggression towards them as a couple has disappeared. He will still alert them when people arrive, but settles quietly after just a few seconds and his excessive barking has stopped. He doesn’t even bark in the garden anymore and annoy the neighbours. A totally chilled little fellow and everyone loves him now.